Like most other electronic devices, the chargers for our wireless devices consume a bit of phantom power, too. Cell phone chargers. Camera battery pack chargers. Portable gaming device chargers. iPod outlet chargers. Laptop chargers. All of these items (and many others) consume a small trickle of energy when they’re left plugged into an outlet. This is a pretty common problem. Almost every home that I visit has at least a couple outlets with such chargers plugged in to a wall outlet, left there so that it’s convenient to charge devices. Don’t get me wrong. We’re not talking about a huge amount of energy here. My own tests with a Kill-A-Watt meter shows that chargers (depending on type) eat anywhere from 1 watt to 15 watts of energy. Let’s say you have four device chargers that you just leave plugged in all the time for convenience. Each one uses an average of five watts, so they’re using a total of twenty watts. Over the course of a year, that’s 175 kWh. Using a nationwide average of $0.14 per kWh, that’s $24.52 eaten up by leaving those devices plugged in each year. The nice part is that this is a pretty easy problem to solve, both in terms of saving money and in terms of convenience. All you have to do is get a small power strip with a switch on it, as depicted above. We had one hanging in our garage, but if you have to buy one, shopping around can help you find one for just a few dollars. Plug all of your chargers into it and leave the switch turned off most of the time. 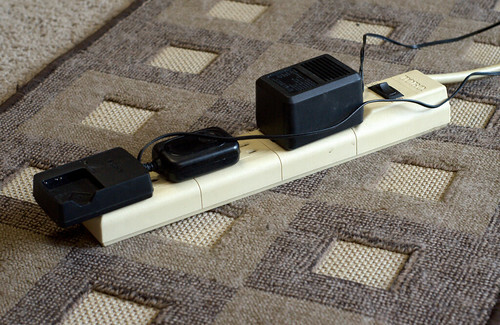 Whenever you need to charge a device, just plug in the device and flip the switch on the power strip. When the device is done charging, flip that switch when you remove the device from the charger. Let’s say that simple move eliminates the power eaten by your chargers 90% of the time. In the example above, that simple move saves you $22 per year. The thing is, the savings is secondary to the convenience in this case. Simply having all of my chargers in a single place is really convenient. Whenever Sarah or I need to charge a device, we simply go to our usual place for charging all of our devices, pick the right cable, plug in a device, and flip a switch. When we’re done, we remove our device and flip a switch. There’s no searching for chargers any more, nor is there phantom energy being eaten by those charging devices. Even better, having them on one strip frees up outlets for other uses. It’s convenient and it saves money over the long run.